Y’all, I think I’ve been talking about reading this book longer than actually reading it. I’ve been talking about this for months. Months. And here I am. I read it. I did it. Genuinely, I love the movie a little bit more than this. I grew up watching the movie. It affected me. I cry at the end every time, no matter how many times I’ve seen it. If that damn song comes on — and everyone who has seen the movie knows exactly what song I’m talking about — I have to turn it off in some way because it gets me teary. But this book is excellent as well. As usual, there’s more in the book that was left out of the movie. The movie also shows more about what happened to the two girls who were raped and murdered. The book mentions it, but it wasn’t nearly as graphic or horrifying as the book. (Surprising, right? You’d think King would make it worse.) Other than that, they follow each other closely. I think that I grew to love the characters more in the book, too. The various guards, I felt like I got to know them more. I also got to know Paul more — both as an old man telling his life’s story and as a younger man when he was a guard. Then, the prisoners also felt like they had more to them. I think the only character that the movie did a better job at was John Coffey. He just had more to the movie, probably because the actor was damn good. But, I really loved this book. 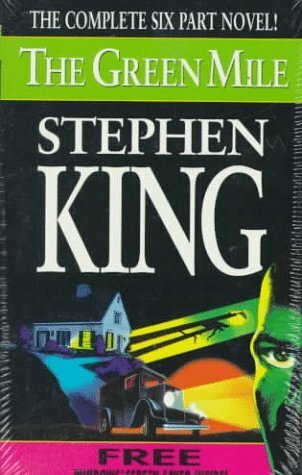 One of my favorite books by Stephen King. It’s so different yet so damn good. Which is better, movie or book?? Thank you! It’s definitely a great one and is one of his best. It feels like such a change of pace, yet it’s so on brand for him. Same with the movie. I haven’t read either of those! I’ll have to check them out soon. Thanks for the recs! !